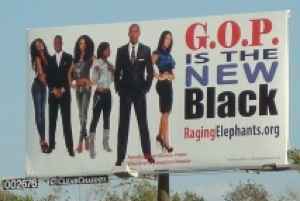 African-American voters have historically been a predominantly strong base for the Democratic party, but a Houston based group called Raging Elephants is looking to change that with a “GOP Is The New Black” campaign. The new billboard depicts a number of well-heeled African-American actors while trumpeting the new slogan. Its also likely to spark a debate that may include allegations of race-baiting, as well as a certain inquiry into where the funds initially came from…coming to a basic cable news program near you!